Freida Pinto, Monica Nyiraguhabwa, Michelle Obama, Karlie Kloss and Zendaya appeared the Today Show to celebrate International Day of The Girl Child on Thursday (October 11). Freida Pinto: The Indian actress wore an Elie Saab Fall 2018 garden green dress with lace panels which made the look feel infinitely feminine. Monica Nyiraguhabwa: The fabulous Executive Director, representing the Girl Up Initiative opted for a fit and flare dress with a glorious African print that totally steals focus. Michelle Obama: Every time I see Michelle Obama I miss her more and more. The former FLOTUS kept things simple and elegant in a white wrap Rachel Comey dress; reminding us all that she will always picks the right look for the right occasion, as the colour white was worn as a symbol of hope and female empowerment. Karlie Kloss: This Brandon Maxwell Spring 2019 dress has my name written all over it, from the hot pink hue to the fitted silhouette and flutter sleeve design. Karlie looks in-cred-ible. Thisis one of her best looks in a while. 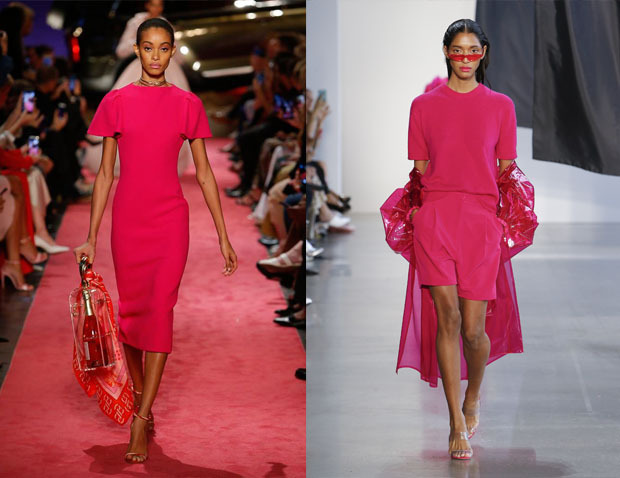 Zendaya Coleman: The actress was clearly on Karlie’s wave length in the hot-pink department. Zendaya’s Sally LaPointe Spring 2019 cashmere tee and trouser shorts felt uber cool and effortless. You won’t be surprised to learn that she styled her look with white pumps, courtesy of Christian Louboutin.